I did actually sign-up for this offer in the past and every season I get a copy of Belle magazine. HBCâ€™s Belle magazine deals with fashion and beauty and offers a look at the latest fashion trends. Click here to subscribe to the free Belle Magazine. 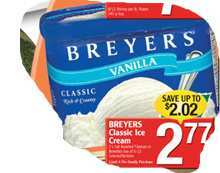 No Frills Ontario 2 week flyer is out and it has some good deals. Here is the NoFrills flyer. 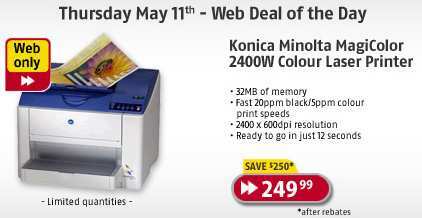 Todayâ€™s Future Shop deal is a Konica Minolta MagiColor 2400W Colour Laser Printer for $249.99 (regular price $500). I wouldnâ€™t personally spend that much money on a printer. Sure, a colour laser printerâ€™s quality is much much better than regular inkjets but unless you have a special need for such a high quality, forget about this deal. Also note that this printer uses 4 cartridges and each one costs a whopping $90! (unless you can find cheap refills). Check out the a Konica Minolta MagiColor 2400W Colour Laser Printer deal here. State farmÂ is giving out a wonderful Free Wedding Planner which usually retails at about $30. To avoid harming State Farmsâ€™ business please only order this free wedding planner if youâ€™re actually getting married soon! Otherwise you donâ€™t really have any use for it. 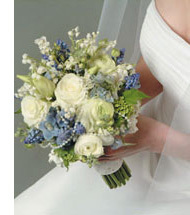 Get your free Wedding Planner here. For many living in/near Toronto or visiting the Hog Town this summer Iâ€™ll be posting Wonderland, Toronto Zoo., etc. coupons, passes and promotions. Get 5% off all car interior and exterior lights at http://www.leveanauto.com/ with the discount code LVNT8657. Today is Future Shopâ€™s 6th day of its 10 days of web only deals. Another good deal today: Kingston 1GB Secure Digital Card for $24.99 after $25.00 discount and $40.00 mail in rebate (regular price $89.99). If you have a digital camera that uses SD cards or any electronic device that uses SD cards this is a good deal. I donâ€™t really like the mail-in rebate partÂ though and if you do decide to buy this product make sure you get your $40 rebate! Note that these cards are NOT for Sony digital cameras or Sony PSPs. Please make sure the device you have uses SD and not any other technology before ordering this card. 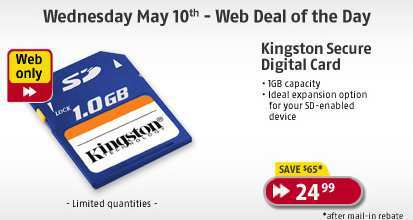 Check out the Kingston 1GB Secure Digital Card here.